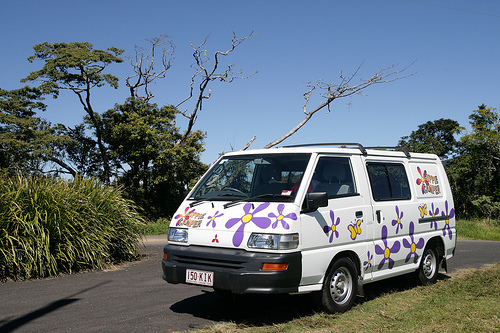 There are many different companies where you can hire backpacker campervans. While many backpackers get around Australia by long distance buses and the buses do take you almost everywhere, it is not cheaper than hiring a campervan when you look at the total cost. And it is definitely not more comfortable! * the freedom to go at your own pace and not worry about time tables. Stop for a lunch when and where you want, not when and where the bus stops. * the opportunity to get to spots the buses and trains don't take you. Take photo stops where you want, don't miss out things that the bus would just drive past. * somewhere to sleep - this is of course the most important thing and the thing that saves you most money. No need to pay for hotel and motel rooms - camping grounds are much cheaper, and there is even a lot of FREE camping in Australia! * somewhere to cook - this also saves you money as it is of course much cheaper than eating out. You may be used to backpacker hostels in cities and towns where there is a kitchen anyway.. but this is not the case everywhere! OK, you find a few backpacker hostels in Coober Pedy and Alice Springs - but that is as remote as they get. There are thousands of more kilometres to do and there won't be backpacker hostels nearly everywhere. As soon as you leave the east coast and cities/towns, without a campervan you would have no choice but pay for hotel and motel rooms. Outback hotels, which really are the old pubs, may be a bit cheaper, but motel rooms are $100ish a night. A site in a caravan park / camping ground is $30ish at the most, but often cheaper as soon as you get a bit inland. And if you want, you can look into FREE camping in Australia, stop in designated FREE camping spots, and don't pay anything for accommodation at all! There are enough of designated free camping spots that with a bit of planning you can do entire trips totally for zero cost of accommodation! Which Backpacker Campervans Are Best? * When you check prices, often the insurance is not included but comes on top of it, and the amount may well vary between different companies and even vehicles. Check if the insurance is included and how much it is. * If you want to get off the bitumen and do some back tracks, consider renting a four wheel drive. It may be more expensive, but it gives you the freedom to get off the main roads. When renting a four wheel drive remember to check if there are any restrictions about where you are allowed to go. There often are restrictions, unless it's a real Trooper. * Short of money but not too short of time? Consider buying a campervan instead! It's cheaper, but worth if the trip is not too short, as the buying and selling may take a bit of time (however you can now get buy back guarantee so no reason to worry about not being able to sell it in the end of your trip). Got something to post on backpacker noticeboard? P.S. This page is brand new so don't be shy to be the first!